Welcome! My name is Gilda Tabarez. I am an avid fan of silent films. I have been watching silent films since I was a small child. My father used to take me to silent film revivals at the now- defunct Avenue Theatre here in San Francisco during the late sixties through to the early eighties. There I enjoyed a great many silent films accompanied by the magnificent Wurlitzer pipe organ. That wonderful theatre is now closed, probably forever, but I will never forget the beauty and magic of the silents which I experienced there. The purpose of this Web site is to share with you some articles and links about silent films, in the hope that you will come to appreciate silent cinema as I do. "Beauties of the Silent Screen [four "hand-tinted" portraits of Billie Dove, Pearl White, Marion Davies and Anita Stewart. A pictorial display from D.W. Grifffith's "Intolerance"
Conrad Veidt Society -- an excellent new site about Conrad Veidt and German silents by R. Peter Stens. 100 Years of Hollywood and the Stars -- film historian William M. Drew's new website. Looking for Mabel Normand / Madcap Mabel Normand -- the undisputed "Queen of Comedy". -- a website (in German) with many photos of one of the greatest stars of the silent era. -- the great star of silent and sound films. Ruan Lingyu -- The Legendary Silent Diva of China! Remember Vilma Banky? -- The Hungarian Rhapsody! Zoom in Focus -- about Egyptian cinema, including silent films. Gareth Hughes--the Welsh film star who became a star for God. Carl de Vogt -- very well-researched site about a major German actor. Olive Thomas -- excellent site about a beautiful silent star. The Norma Talmadge Website -- one of the greatest actresses of her time! Tribute to Betty Bronson -- the charming actress who played Peter Pan. Wallace Reid, silent film's King of Paramount -- the "Valentino" of his era. A Sense of the Twenties - Fascinating look at life during the Roaring Twenties. The Virginia Lee Corbin Scrapbook -- "The Dresden Doll of the Movies". The Unofficial Lars Hanson Page -- Great page dedicated to Sweden's finest classic actor! The Silent Film Society of Atlanta's Home Page - Superb silent film site! Silents Are Golden - All about the greatest era in cinema history! Dolores Costello Barrymore -- Goddess of the Silent Screen. The Clara Bow Home Page -- Bill has the best Bow site on the Web! The Silent Worlds of David B. Pearson -- Wonderful! Silent Movies -- check out Kally's excellent site! The Lon Chaney Home Page -- the first and best site devoted to the Man of a Thousand Faces! The Silent Western -- very well researched. Von Stroheim's ~Greed~the immortal classic has a site of its own. Leonard Attwell - I sincerely want to help you! Amoagh Productions -- Old Time Monologues! Michelangelo Verso Homepage -- opera heaven! Eldritch Press -- free online books! 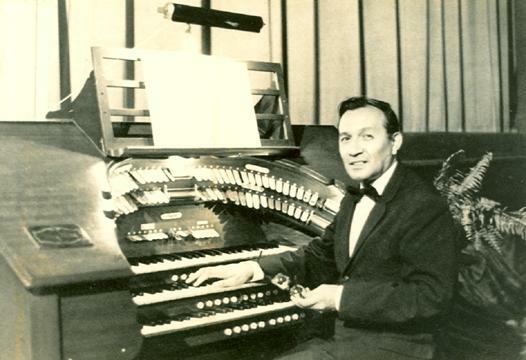 Alex Santos at the Wurlitzer pipe organ, San Francisco. "The Perfect Song" on the mighty Wurlitzer organ. Recorded at the Avenue Theatre in San Francisco (which, sadly, is no more). Lo! two happy hearts are one! Perfect love of hearts forever plighted! In perfect love's June day! Click here for a complete midi version of this song by an unknown artist. Usually performed before the main feature or during intermission. Theme song from "Seventh Heaven" (1927) starring Janet Gaynor and Charles Farrell. Theme used in "The Sheik" (1921) starring Rudolph Valentino. Old song from Spain used in any number of silent features with a Spanish or Mexican setting. Classical theme used in "The Thief of Bagdad" (1924) starring Douglas Fairbanks. Organ Recordings Copyright © Alexander Santos. a remarkable man and a gifted writer . He was a champion of silent film preservation and presentation. and for the articles he graciously contributed to this website. This site best viewed with Netscape Navigator 3.0 or above. Images and texts on these pages are intended for research or educational use only.